For my birthday, I received a Ovation Elite TX 1788 as a gift. It looks amazing, it is easy to play (with my stubby fingers), and, most importantly, it sounds freaking incredible! I can't stop playing it. For a while I have been looking to move up from my starter acoustic Fender guitar to an acoustic with a cutaway that I could plug into an amp. I had heard dubious things about Ovations in the past. I started getting interested in them when Charlie Pace found his guitar on LOST (You all Everybody!). A month or so ago I was lucky enough to see REO Speedwagon live and Kevin Cronin's masterful showmanship on his Ovation made me reconsider the ovations. A few months ago my son and I were goofing off at the local guitar chain store and I tried out the Ovation TX Elite because it just looked so different. I was overwhelmed by how full and rich it sounded. 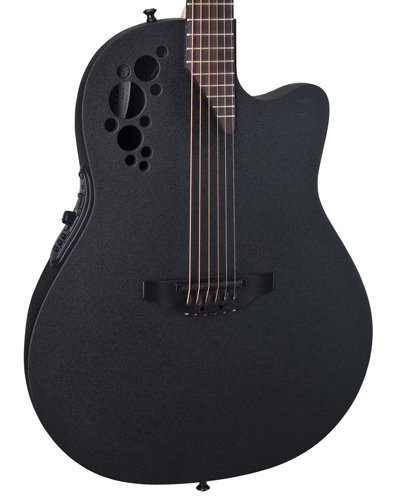 When I found out Ovation Guitars were created and designed by a noted Helicopter Designer, Charlie Kaman, it was pretty much a slam dunk to be a strong candidate for becoming my new acoustic. After checking to see if any of the local guitar stores carried Ovations and Seagulls, my son and I went back to the guitar mega store and spent about 2 hours playing the Ovation TX Elite 1778 (mid-depth bowl) and several Seagull Entourages (black and rustic browns). Plugged and unplugged. There was no disputing the Ovation sounded better, richer, and fuller. I tried other Ovations, better Fenders, Takamines, Yamahas, and different models of the Seagulls. I double checked to make sure the offset rosette-style sound hole was not giving it an advantage over the other guitars, since it was closer to my ears; but my son played it from across the room and it still sounded better than the others. The Ovation was hands-down the best sounding guitar in the room. took my wifeís usual advice and did not go cheap on this. back of Ovations are made from, it is actually AA spruce with scalloped brackets, just finished off in the stealth Lyrachord finish. The neck is natural maple and it feels great in my small hands. 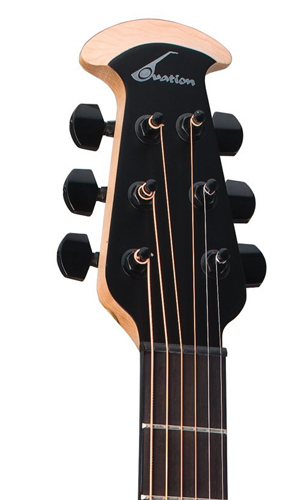 The black finish and black tuners against the maple on the headstock look very striking. It is a mid-depth bowl on the back and I was warned that they have a tendency to slip off your lap, but I put on a cool strap and have not had an issue. One of the things I really like about it is that it does not require pegs when changing the string – they feed right through the bridge like on my electric guitars! Although it was pretty well set up, I can adjust the action by removing a few shims. I am a mediocre guitar player at best. With this Ovation, songs that I usually fumble around a bit on, like Dear Prudence or the intro to Long Ago and Far Away come out clear and rich. The maple neck just fits really well in my hobbit-hands and allows me to reach frets I can usually not hit consistently. So although, it may look weird or you may have not have heard great things about Ovation guitars, it is definitely worthwhile to check out an Ovation TX Elite 1778. It is an amazing guitar! Charley Likey! 1980s Shoot out: DeLorean versus the World.